We chase perfection, however elusive, not because we think we’ll ever be perfect, but because we believe it brings us closer to excellence in everything we are and ever hope to be. We chase perfection, howeverelusive, not because we thinkwe’ll ever be perfect, butbecause we believe it bringsus closer to excellence ineverything we are andever hope to be. For more than 20 years, I have been designing, developing, and managing business intelligence solutions. Leading small, agile teams, I create opportunities for innovation with user-centric solutions built on the principles of design thinking. 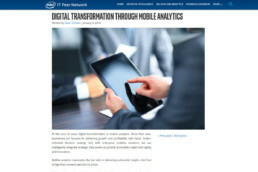 Creating opportunities for digital transformation through mobile BI since the birth of smartphones and tablets. Specializing in the C-suite, I help executives drive growth and profitability with mobile BI. is not a backward-looking reaction to a shift in marketplace or in consumer demand. Instead, it is about creating the next opportunity. User-centric design is about looking out from the inside—rather than outside in. Competing on design thinking requires a fundamental shift in how we approach design to solve business problems. Success with analytics comes with the relentless pursuit of analytics excellence for user-centric solutions. It demands innovation through leadership and talent because technology alone can't match human ingenuity. The pursuit of thought leadership is one of the greatest tools that helps us grow as an individual and learn more about our purpose, which is a reflection of both our passions and imperfections. 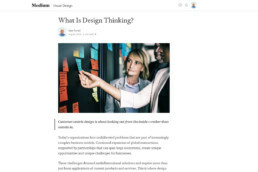 I write about current topics that matter to the C-suite, including digital transformation, design thinking, and innovation. Let's stretch old ideas beyond their traditional boundaries and create new perspectives that serve as a foundation for future innovation and inspire conversations that would have been otherwise lost or never started. Let's stretch old ideasbeyond their traditionalboundaries and createnew perspectives. DISCLAIMER This is my personal website, and the opinions I express are my views. They do not reflect the opinions of my employers or any other associated organizations.